Sheraton-influenced furniture dates from about 1790 through 1820. It is named for the famed London, England furniture designer and teacher Thomas Sheraton (1751-1806), who trained as a cabinetmaker. He is very well known for his written guides, especially his first, The Cabinet-Maker and Upholsterer's Drawing-Book, published 1791-94. A neoclassic style, Sheraton design falls within the Federal period in the United States. Sheraton's work often overlaps with that of British designer George Hepplewhite, whose 1788 guidebook, like Sheraton's, documented the most popular designs of the day. However, the slightly later Sheraton style tends to be simpler, almost severe in comparison, and favors "a fiercely rectilinear silhouette," according to American Furniture: 1620 to the Present, by Jonathan L. Fairbanks and Elizabeth Bidwell Bates. Few pieces actually built by Sheraton himself survive today. But his designs and ideas influenced entire generations of furniture-makers, especially in the young United States, as seen in the works of early American masters such as Duncan Phyfe, Samuel McIntire, and John and Thomas Seymour. Because Sheraton furniture is characterized by contrasting veneers and inlays, pieces often contain more than one type of wood. 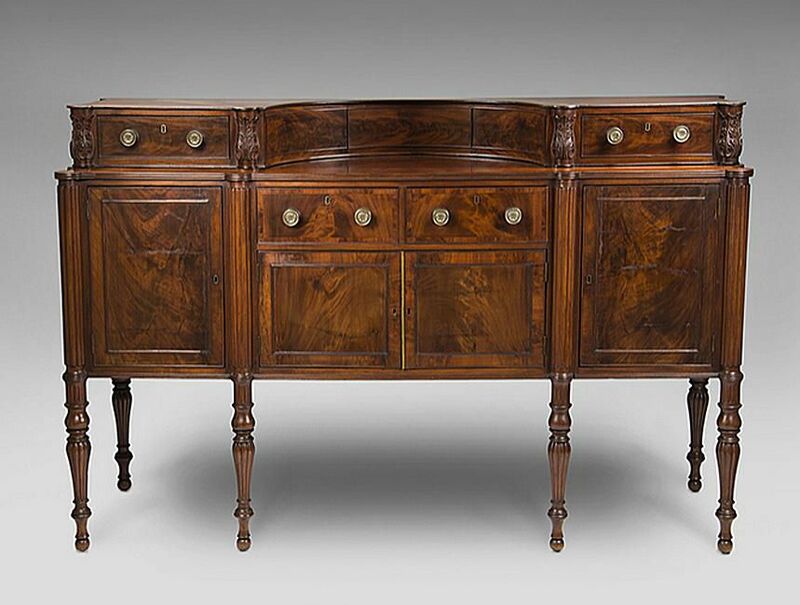 For the base, satinwood was a favorite among furniture craftsmen, but mahogany and beech were also popular. For the decorative elements, common woods included tulipwood, birch, ash, and rosewood. Since craftsmen frequently used the local woods at hand, American versions of Sheraton's designs might use cedar, cherry, walnut, or maple as well. In contrast to the popular cabriole legs of earlier styles, such as Queen Anne and Chippendale, Sheraton pieces usually have straight legs although they can be tapered at times. Occasionally the back legs in these pieces would be splayed. They are often rounded (another distinction from Hepplewhite, who preferred a square-shaped leg on his designs), and frequently have reeded edges, in imitation of Classical columns. They are sometimes joined together with stretchers. Complementing the slim, straight legs of a chair or table, Sheraton-style feet are usually simple: a rectangular spadefoot, a cylindrical foot, or a tapered arrow foot. Bracket or bun feet might appear on heavier case pieces, such as chests, desks, and bookcases. Sheraton is known for its light, elegant appearance, especially delicate compared to earlier Queen Anne and Chippendale styles. Pieces are embellished with small, low-relief carvings or painted designs, along with intricately patterned and detailed marquetry and veneers, often in dramatically contrasting woods. Some pieces are completely painted, dyed, or japanned (coated with a thick black lacquer). Common motifs include drapery swags, lyres, ribbons, fans, feathers, urns and flowers in the neoclassical tradition. Typical hardware on case pieces included lion's heads, stamped plates, rosettes, and urns. Pieces have simple but strong, well-proportioned geometric shapes, that are usually square or rectangular. Sofa and chair arms often flow cleanly into the back, without a noticeable break, and the backs themselves are square-shaped. The square-back sofa with exposed arms and reeded legs is perhaps the quintessential Sheraton piece. Sheraton is credited with popularizing the placement of gathered silk behind the glass doors of bookcases, cabinets, and sideboards. He had a penchant for including secret drawers and mechanisms for sliding sections on secretaries, tables, and desks. Sheraton's later books, especially The Cabinet-Maker, Upholsterer and General Artist's Encyclopedia published in 1805, show a shift in his style, towards the developing Empire mode: the designs are heavier, gilded, with more solid turned legs, and even claw feet. Cane or rush seats, however, do retain some of the lightness of his earlier pieces. British furniture manufacturers began making styles similar to Sheraton and Hepplewhite originals in the 1880s. Though many have become collectibles in their own right, these mass-produced revival pieces tend to lack the lightness and intricate detail of authentic period pieces. In a sense, this type of furniture has never gone out of style and modern furniture makers find inspiration looking back at Sheraton's work. Features such as the straight back and reeded legs, along with the ideal of a balanced, symmetrical shape, remain standard in classic furniture design even today.